The role of music in film is undeniably powerful. With the ability to create and enhance emotions, music has always been an essential ingredient in good film. From horror through to romance, silent movie improvisation to Blockbuster film scores, come and explore this diverse and emotive world with us. 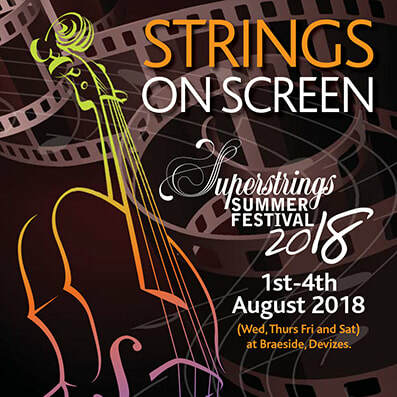 Join Superstrings for a fun and creative four days of playing music in orchestras and chamber groups, singing and producing beautiful artwork. Led by a team of professional musicians and artists legendary for their enthusiasm and creativeness, the Strings on Screen Summer course looks set to be great fun! Those on the residential course will have the opportunity to continue the fun into the evenings, with both musical and non- musical activities for all. Along with the regular talent contest and film night, the residents will be able to explore the high ropes and this year, a Ceilidh workshop with playing and dancing! Have fun with new friends and enjoy making music in the relaxed surroundings of Braeside in Devizes.